"Celebrate Valentine's Day with a romantic dinner for two!" Valentine's Day is named in honor of Saint Valentine, who lived during the Roman times. There is a belief that when Valentine died, he left a note to his jail keeper's daughter which was signed, "Your Valentine." People have been sending similar messages to their loved ones since then. It's the time of year to celebrate romance again. Actually, it's always the time of year to celebrate romance, but this is the time that society, at the prodding of greeting card and chocolate manufacturers, sets aside especially for such amorous festivities. Every February, across the country, candy, flowers, and gifts are exchanged between loved ones, all in the name of St. Valentine. But who is this mysterious saint and why do we celebrate this holiday? The history of Valentine's Day -- and its patron saint -- is shrouded in mystery. But we do know that February has long been a month of romance. St. Valentine's Day, as we know it today, contains vestiges of both Christian and ancient Roman tradition. So, who was Saint Valentine and how did he become associated with this ancient rite. These Valentine's Day recipes are a perfect way to celebrate a special relationship or just treat yourself and your family on valentine's day. I myself like valentine's day because it can be such a cozy time of year, with the fireplace crackling and the house full of good smells from baking and cooking. Here are some tried and true recipes that will add some romance to your Valentine's Day. After all, nothing says LOVING like something from the oven! According to one legend, Valentine actually sent the first 'valentine' greeting himself. While in prison, it is believed that Valentine fell in love with a young girl -- who may have been his jailor's daughter -- who visited him during his confinement. Before his death, it is alleged that he wrote her a letter, which he signed 'From your Valentine,' an expression that is still in use today. Although the truth behind the Valentine legends is murky, the stories certainly emphasize his appeal as a sympathetic, heroic, and, most importantly, romantic figure. It's no surprise that by the Middle Ages, Valentine was one of the most popular saints in England and France. I feel that Valentine dinners should be special. Choose your sweetie's favorite foods and surprise him or her with a wonderful romantic meal and a special table set for two. If you have a fireplace, set a small table close by, and use your most delicate china and crystal. A few candles and a small, low bowl of fresh flowers will complete the atmosphere. .
Yummy Chocolate Recipes For You To Enjoy! 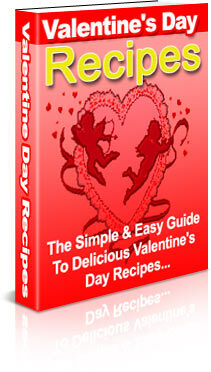 Valentine's Day Recipes is delivered in PDF format and is viewable on any computer. All you need is Adobe Reader which is available free and already on most computers. Taste tempting flavors of hot fudge sauce and whipped cream pair up with cherries for a Valentine's Day dessert that is guaranteed to melt hearts. Allow both crust pouches to stand at room temperature 15 to 20 minutes. Remove one crust from pouch; unfold. Press out fold lines. If crust cracks, wet fingers and push edges together. Sprinkle 1 teaspoon flour over crust. Turn crust, floured side down, on ungreased cookie sheet. Using paper pattern as guide, cut crust into heart shape. * Generously prick heart crust with fork. Bake in a preheated 450-degree oven 9 to 11 minutes, or until lightly browned. Let cool. Repeat with the remaining crust. Combine cream cheese, confectioners' sugar and almond extract in a small bowl; beat until smooth. Add whipping cream and beat until thickened. 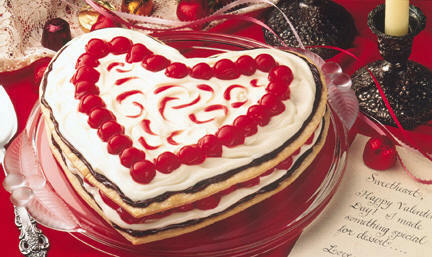 To assemble, place one heart-shaped pie crust on serving plate; spread with 1/3 cup of the hot fudge. Carefully spread half of cream cheese mixture over hot fudge. Spoon 2/3 of the cherry filling over cream cheese. Spread second crust with remaining hot fudge and place over filling. Carefully spread with remaining cream cheese mixture. Spoon remaining cherry filling about 1 inch from edge. Refrigerate until serving time. Store any remaining torte in refrigerator. * To make pattern, cut a piece of paper into a heart shape about 10 1/2 inches high and 10 inches wide.